Thousands of worshippers cheered and waved flags as the Pope celebrated Mass in Birmingham's Cofton Park on the fourth and final day of his state visit to the UK. Armed with umbrellas, waterproofs and folding chairs, pilgrims braved the rain after setting off in the early hours to get to the open-air Mass. As the Pope made his way through the park in his iconic white Popemobile, there were huge cheers, particularly when he stopped to bless some babies in the crowd. One woman, crying tears of joy, dropped to her knees as the Pope went past her. 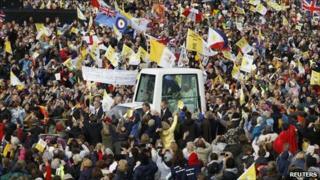 People chased alongside the Popemobile waving banners with slogans such as "100% Catholic" and shouting, "We love you, Pope Benedict". Niamh Malone, 25, a Catholic youth worker from Lincoln, said seeing the Pope was "phenomenal". She said: "It was out of this world to see him, I cannot tell you how incredible it was. "That is why we came, we just wanted to see him in the flesh." West Midlands Police said 1,000 coaches had arrived in Birmingham for the Pope's beatification of 19th Century theologian Cardinal John Henry Newman, which 55,000 people were expected to attend. The Emmanuel Community from Paris set off three days ago, stopping in Oxford to see where Cardinal Newman studied. They then followed the Pope to Hyde Park and Birmingham. Father Julian Antoine, 32, who was ordained on 4 July, said: "I have seen him before in Sydney and Rome but every time is different. "Each time is a chance for God to say something to me personally through the Pope." The crowd fell silent as the Mass began - only the sound of waterproof jackets rustling and a baby crying could be heard. The first hymn, written by Cardinal Newman, took on particular significance on the day he came a step closer to becoming a saint. Pilgrims held up their mobile phones and digital cameras to capture the moment. "Bless him, he must be tired, he's 83 for goodness sake, he wants to be tucked up with a hot water bottle," one worshipper, dressed in pink and green spotted wellies, said. After the proclamation of Cardinal Newman as blessed, people cheered and cried "well done". "I love all the pomp, I just love it," one woman told her neighbour during a musical interlude in the Mass. Worshippers young and old had gathered at Cofton Park for the Mass. Sam Speed, aged nine, from St Philip Neri Catholic Primary School in Mansfield, Nottinghamshire, said: "It was amazing. We sang my favourite hymn." He said his family had started out at 0130 BST to make sure they got a good spot in the park. Brigid Peelan, from Market Harborough in Leicestershire, said she had not slept all night because she was so excited about the Mass. She said she had previously travelled abroad to see the Pope, but added "it is different to see him on your own doorstep". Volunteer medic Nick Crombie, who is clinical director for the Midlands Air Ambulance, said first-aiders had provided at least 200 foil blankets for people suffering from cold, some wearing inappropriate footwear such as sandals. Mr Crombie, who normally works at music festivals, said: "The atmosphere is much nicer here. "Everybody is getting on with each other and they're not drunk. "Although some things never change - people have come completely unprepared in silly footwear." After the Mass, the Pope was applauded as he left the stage and headed to a private visit at the Birmingham Oratory on the Hagley Road, leaving Catholics in Cofton Park to eat their lunch and reflect on the Mass. Shelia Freeman, from Streatham in London, had an atheist upbringing and converted to Roman Catholism five years ago after her husband's death. She said: "Seeing the Pope has really helped to strengthen my faith, as has being here with like-minded people because many of my friends are not religious." Ian Sesnan, also from Streatham, said he chose to come to the Mass in Birmingham because he wanted to take part in history. "To see so many Catholics coming together shows our faith is a living faith and not just something that existed hundreds of years ago," he said.